Andrew and Dave 1 started things off at the Early March Working Party, arriving on Wednesday evening and starting work on Thursday morning. First thing was to locate the profile cut plates which had been ordered a few weeks previously, and to take them to the C2 Shed. Amongst the plates were several sets of disks, which are to be used to make the coupling rod bearing covers. These covers are machined all over, so holding them during the turning operations is not so easy. Andrew and Dave 1 spent a while trying to devise a sequence of turning operations which wouldn't involve an excessive number of operations, or any time consuming setting up. We have 20 of these cover plates to make, to the process has to be practical. With no simple process being apparent, the works staff were asked for advice. Martin and Dewi took a quick look at what we were trying to do, and immediately proposed a process which was quick and easy. How did we not spot that?! Andrew took a look around the workshops and found a lathe with a suitable sized 3-jaw chuck, and the job could start. Holding the workpiece in the laser cut bore, using inside jaws in the chuck, the front face and outside diameter could be turned. 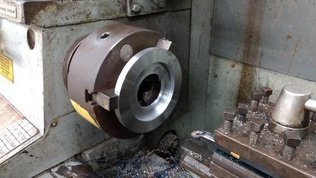 Then the workpiece is turned round, outside jaws are used to hold the outside (machined) face, and the rear face, rear recesses and the bore are turned to their final dimensions. By working on all pieces simultaneously, changing the jaws in the chuck only needed to be done once. Actually, we carried out a full set of turning operations on the first cover plate, even though we had to change the jaws an extra time, to make sure everything could be done in the correct order. The process worked! One turning operation which couldn't easily be done in the 3-jaw chuck was putting a bevel on the outside edge of the front cover plates. It's a 'decorative feature' which makes the covers look neat, and one which we wanted to keep. 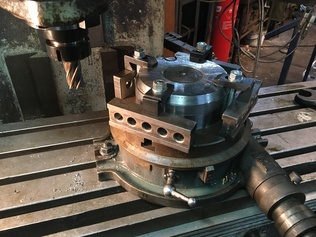 For this operation, Dave 1 turned up a mandrel onto which the cover plate could be mounted using the machined bore (we don't want to damage it by using the inside chuck jaws), enabling him to turn the bevel on another lathe. After a couple of days work on the lathes, the first coupling rod bearing front cover plate was fully turned, and another six were well under way. Erle, Dave 2 and Chris joined the working party on Saturday morning. 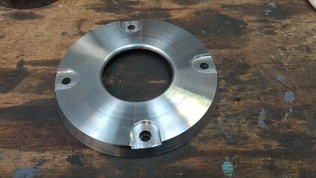 Chris was tasked with devising a process for drilling four holes in the coupling rod bearing cover plate, and milling a recess for a bolt head around the holes on the front cover plates. We thought this would be relatively easy. It wasn't! The ideal tool for milling/drilling four equally spaced holes around the centre of a round plate is an indexing table. Boston Lodge has one, so Chris looked over it to understand how to rotate the chuck to a vertical axis, so that it could be used on a milling machine. With that learned, he then realised that the indexing table would be too tall to fit even on the big Bridgeport milling machine. Back to square one. Next best option is to use a rotary table. Boston Lodge has two of these; a small one and a big one. Both fit on the Bridgeport milling machine, but the big rotary table is so heavy that it really requires a crane to lift it safely. So let's use the small rotary table then. First problem identified with that is that the T-slots in the table are a bit smaller than most, so none of the blocks in the clamping sets will fit it. Andrew welded nuts onto the sides of the heads of some bolts (Chinese style) to resolve this problem. Using these bolts, Chris found that the smallest clamps in the clamping sets were just the right size to clamp the cover plates onto the rotary table. 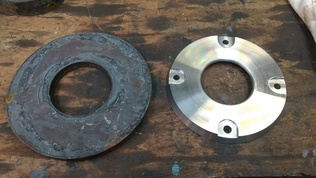 To make it easy to centre the cover plates on the rotary table, and to centre the rotary table on the milling machine, Dave 1 turned up another mandrel and a centre point. The mandrel also holds the cover plates clear of the table, so that they can be drilled through. But when Chris came to use the mandrel, he found that, due to the extra height, he needed to use larger clamps, which then took up extra space making it impossible to machine all four holes. After some head scratching, small parallels were placed around the edge of the cover plate, so that the small clamps could be used. At last, the job was suitably centred and clamped, or so we thought. The mandrel supports the centre of the cover plate, while the clamps are arranged around its edges. Since the cover plate is not terribly thick, there is a limit to how tight the clamps can be without distorting the cover plate. Upon starting to take the first cut with a 1″ mill, the cover plate span round, insufficiently well clamped. What was clearly needed was a means of supporting the edge of the cover plate, to allow it to be clamped more firmly. The support needed to be in the form of a tube, not too large to interfere with the clamps around the edge of the cover plate, but not too small to interfere with the drilling of the holes through the cover plate. Chris and Dave 1 found some steel tube of approximately the right dimensions. Dave 1 turned its outside diameter down to that of the outside of the cover plates, bored the inside out enough to clear the bolt holes in the cover plates, and faced it off very slightly longer than the body of the mandrel. Chris then fitted it under the cover plate on the milling machine, and clamped it firmly down. After two days of trials and tribulations, the recesses for the bolt heads in the first coupling rod front cover plate were milled successfully. Chris then spotted the centres of the four holes with a centre drill. Drilling the holes should have then been easy, but guess what, it wasn't! First attempts using a drill resulted in a lot of chattering, which risked breaking the drill. Since we were using a milling machine, a slot drill seemed like a better bet, but that went wrong when the slot drill broke. At this point it was decided to call it quits for the weekend, and the equipment was tidied away. At least we have a proven method for quickly setting up the cover plates on the rotary table and centring them on the milling machine. 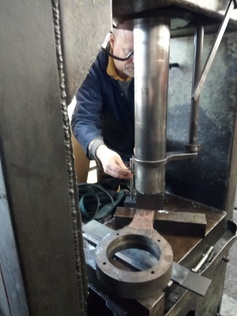 While the above had been going on, Dave 2 quietly got on with completing the reaming of the draincock weighshaft support brackets which he had started at the previous working party. It didn't take him long to complete the task. Next to receive Dave 2's attention was the C2 Project's wheelbarrow. It had succumbed to the ailment afflicting most wheelbarrows at Boston Lodge; a flat tyre. It was a Saturday night homework job for Dave 2 to take the inner tube home and patch it. We may look into replacing the wheel with a puncture-proof one if this turns out to be a regular problem. Dave 2's other homework project, lapping in the draincocks, is also under way. He showed us a couple of valves he has worked on so far, and they are looking very good. Dave 2 then spent the remainder of the weekend de-scaling most of the profile cut plates for the tender brakegear. It's a tedious job, but an essential one, as paint won't offer any corrosion protection if applied over mill scale. Erle's previous measurements of motion parts had identified that one of the connecting rods was bent. He and Dave 1 therefore spent a couple of hours on Saturday morning straightening the offending rod. 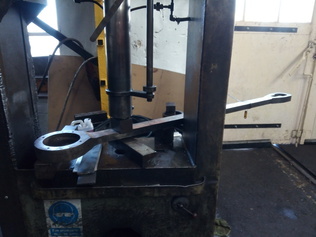 As was done with the bent coupling rod a few months back, the connecting rod was placed under the hydraulic press, supported on steel blocks. The press easily bends the rod towards its intended geometry, but it tends to spring back to its original geometry when the force is removed. Knowing how far to bend the rod to take it just a little beyond its elastic limit is not easy, but after several iterations of applying force then re-measuring the permanent displacement, the rod is a lot straighter than it was. Erle has now carried out a thorough re-measure of the straightened rod, and has drawn up its new geometry on his motion assembly drawing. We can now start to decide how to adjust the big end bearing cover plates and bearing spacers, to correctly align the cylinders. The major part of Erle's weekend was spent continuing the refurbishment of the lubricators. He has identified the correct seals which are required, and has obtained samples. 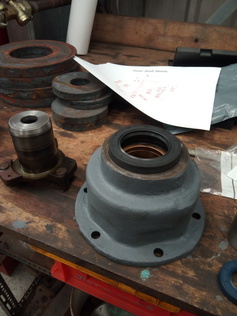 These will require special tools to push them into place without damaging the sealing faces. With a series of tools drawn up, Erle turned them up from offcuts of steel. Each lubricator contains an oil strainer and a fine filter. The filters are so fine that we doubted that cylinder oil (very viscous when at room temperature) would pass through them. Robco provided us with a sample of similarly fine gauze, and Erle carried out a test. To his amazement, cylinder oil does flow through it, albeit slowly. This proves that if we repair the filters using the fine gauze originally fitted, they will work as intended. next stage is for Erle to manufacture a spare oil strainer, and to work out a method for re-manufacturing the oil filters. Andrew and Dave 1 stayed on for the Monday, making it a five day working party in total. This gave Andrew the chance to finish turning the surfaces of the seven coupling rod bearing cover plates he'd been working on. Dave 1 took the opportunity to ask the works staff for advice on drilling the cover plates. The material is tougher than normal steel, but shouldn't be impossible to drill. Dylan lent him a good quality drill, and Robco advised on drilling speeds. 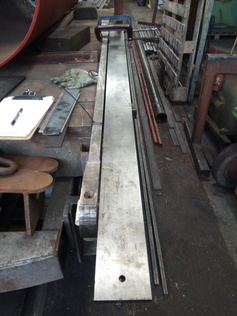 Using the Asquith pillar drill, the four holes in the first coupling rod cover plate were completed. More lessons learned. Making that first coupling rod cover plate took the best part five days. But we've now got a process that we know works. It will be much quicker to complete the others. Some will require different size mandrels, but they are easy to turn up now we know what we want. Special thanks must go to the staff at Boston Lodge works, who are always happy to share their expertise in achieving the seemingly impossible. The C2 Project would progress at a much slower rate without their help.